We fundamentally have control of two aspects of our long-term health: exercise and healthy eating. Though exercise has been classically researched, the field of nutrient has largely gone understudied until recently. In the age of fast food and precooked meals, there have been an increasing number of efforts to assess nutritional status and nutrient intake for evaluating nutritional sufficiency. This becomes increasingly important as we age due the decrease of digestion efficiency and nutrient uptake. Unfortunately, nutrient evaluation has been surprisingly subjective and qualitative, with many gold standard evaluations consisting of pen-and-paper reporting. To address this problem, we have been developing diffuse optical imaging systems and machine learning models for nutrient assessment and sensing. Leveraging the well-studied fields of quantitative biomedical optics and biophotonics, our systems are designed to extract quantitative nutrient information as a fundamental tool to support nutrition research. Modified texture diets are used for persons with dysphagia (swallowing difficulty), but assessing the food's nutritional status is challenging. Optical imaging systems provide a powerful solution to nutrient estimation. Specifically, these systems enhance visual optics with computational models for objective and repeatable estimation. Borrowing from the field of biomedical optics, photon migration models have been used to estimate quantitative properties of the medium based on photon absorption and scattering. This hypothesis is driven by a theoretical optical dilution model. As a photon traverses through the food, it undergoes a series of scattering and absorption events according to the constituent chromophores, resulting in the perceived colour. As a puree becomes diluted, the relative concentration of water increases while the photon path length stays relatively constant, leading to decreased overall absorption and thus changes in perceived colour. Using blueberry puree as an example, an optical dilution model was developed based on the Beer-Lambert law of light attenuation (1). 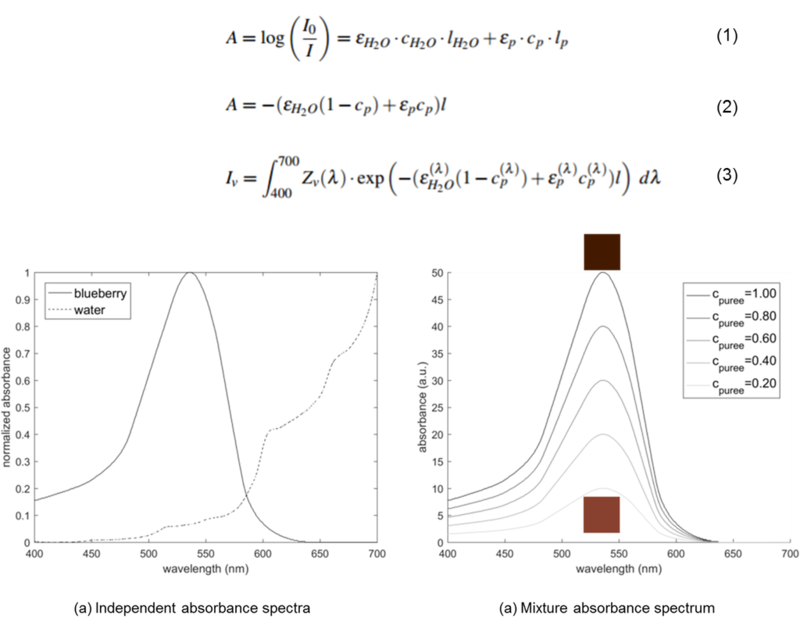 Specifically, assuming a homogeneous dilution mixture (lH2O ≈ lp), normalized incident illumination (I0 = 1), and normalized relative concentration (cH2O +cp = 1), this formulation simplifies to (2), and can a perceptual image patch can be computed by computing the perceived colour spectra according to the visual system's cone responsivity curves (3). K. J. Pfisterer, R. Amelard, A. G. Chung, A. Wong, "A new take on measuring nutritional density: The feasibility of assessing commercially-prepared puree concentrations using a deep neural network," Scientific Reports (Submission no. SREP-17-07353), Feb 14 2017.